Johnson Controls-Saft have announced that they will supply the complete battery system for two electric vehicles which will be launched by the Beijing Electric Vehicle Company (BJEV), a subsidiary of Beijing Automotive Industry Company (BAIC). BJEV and BAIC have plans to manufacture 150,000 hybrid electric vehicles (HEVs) and battery electric vehicles (BEVs) by 2015. "The electric vehicle market in China represents a tremendous growth opportunity for the automotive industry," said Ray Shemanski, who leads the Johnson Controls-Saft joint venture and is vice president and general manager of Advanced Battery Systems for Johnson Controls Power Solutions. "While this electric battery system is the first China-specific product designed and developed by our advanced battery team in China, it leverages our proven technology currently in production in Europe and the United States, and indicates the potential of a quickly growing China market." The Johnson Controls-Saft electric battery system will power the C30 and M30 electric vehicles, which are initially launching in an evaluation fleet of 2,000 units beginning later this year. 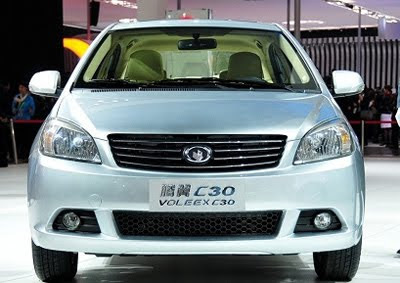 The C30 is a A0 segment subcompact hatchback while the M30 is a small cross-over vehicle based on the same platform. Both vehicles have been adapted with an electric powertrain by BEVC. "This fleet will provide critical and early customer usage and feedback information to support full product launch to consumers in 2012," said Dr. Dazong Wang, - the President of BAIC. "We look forward to working with Johnson Controls-Saft and other key component suppliers to meet our goal of producing 150,000 HEVs and BEVs vehicles by 2015." The C30 and M30 can travel more than 100 kilometers on a single charge. Johnson Controls-Saft is supplying the complete battery system, which consists of 106 prismatic lithium-ion cells, the battery management system and integrated battery package to accommodate the existing vehicle platform.